Bus users in St Helens are benefitting from £1.5m investment in improving bus travel thanks to the work of the Liverpool City Region Better Bus Area project (BBA). The BBA is a positive collaboration between Merseytravel, St Helens Knowsley and Halton Borough Councils and bus operators Arriva, Stagecoach, Halton Transport and Huyton Travel. Together they have been responsible for coordinating and delivering a total of £3.5 million bus infrastructure improvements in St Helens, Knowsley and Halton during the past four years (2013/14 to 2017/18). Relieving congestion, improving connectivity and improving infrastructure are the BBA’s core aims. The BBA members identify and then allocate funds and resources to improvement schemes, which can include upgrading traffic signals, bus stops or road junctions that will contribute towards achieving those aims. Improving road junctions or traffic signals can for example aid the smooth flow of buses through the junctions, have a positive impact on journey time and contribute towards reducing congestion. 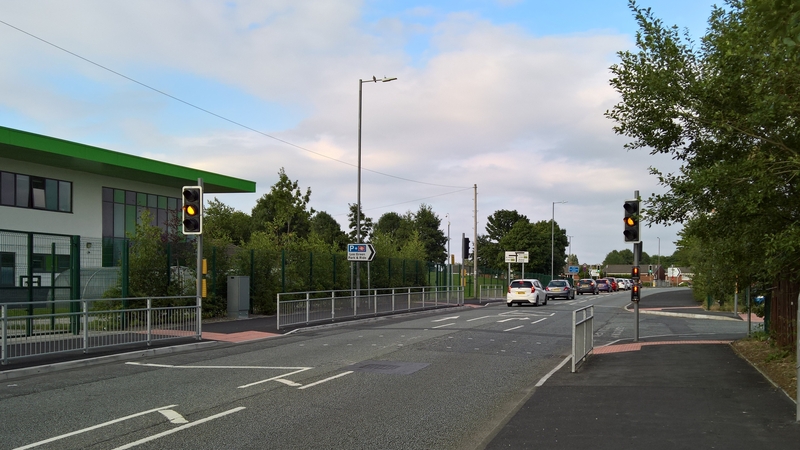 · Upgrading of traffic signals at the south exit of the St Helens Bus Station onto Bickerstaffe Street and at the adjacent junction at Library Street. St Helens has and will continue to benefit as a result of the Better Bus Area programme, in which a number of junctions that were causing delays in bus journey times have been upgraded. One such junction is the A57 Warrington Road/B5419/Jubits Lane junction, where carriageway widening works have enabled buses travelling along Warrington Road to now pass vehicles queuing to turn right into Wilmere Lane. This is now reducing these delays, whilst improving bus journey times, as well as improving the operational efficiency of the upgraded traffic signals and providing improved pedestrian crossing facilities, thus increasing road safety. The BBA scheme is coming to an end this year and a final progress report will be submitted to the Department for Transport in September. The report provides an on-going record of how the project has been delivered and forms the basis for any subsequent analysis of delivery as required. It can also be shared as best practice within the industry. The National Bus Passenger Satisfaction Survey (BPS), which included bus passengers within the BBA led by Transport Focus took place between September and December 2016. Merseytravel on behalf of the BBA compared the results of the 2016 survey with baseline data collected in 2014. Cllr Liam Robinson, chair of The Combined Authority Transport Committee, which oversees the work of Merseytravel said: “The BBA is very much a pre-cursor to the Liverpool City Region Bus Alliance and was highlighted by the Department for Transport (DfT) as a strong example of best practice for partnership working. “In addition to the obvious improvements to bus flows there are added benefits for residents which align with the Bus Alliance ambitions of getting more people on the bus and helping to broaden people’s horizons by providing better access to employment, education and training opportunities. “I very much welcome this injection of external funding into public transport which a large number of St Helens residents depend on to go about their daily business. “Together with great offers including the MyTicket for youngsters and the ‘all area’ Solo bus tickets, achieved under the Bus Alliance, these developments make travelling by bus a better option for the public. Rob Jones, Managing Director at Stagecoach Merseyside, Chester and South Lancashire said: “As bus operators we strive to provide our passengers with reliable bus services. With more vehicles on the road than ever before, congestion at pinchpoints across the network can cause delays.